Heart of Story: Salome’s dance pleased her step-father so much that he promised her any boon that she requested. She asked for John the Baptist’s head and received it. Back Story: Although her name is not given in the Bible, Salome was the daughter of King Philip and his wife, Herodias. When Herod Antipas saw Herodias he wanted Herodias for his wife. They conspired so that Herod Antipas divorced his wife (Phasaelis) and Herodias divorced her husband (Philip). Herod Antipas and Herodias married and went to live in Herod Antipas’s kingdom. Salome, the daughter of Philip and Herodias, went to live with them. John the Baptist was the greatest Israelite prophet at the time and very poplar with the people in the land. Forthrightly, John condemned Herod Antipas for his marriage to Herodias. At the least, Herodias and King Herod Antipas committed adultery. Herod Antipas had John arrested saying that John preached rebellion and subversion. John was placed in prison at Machaerus, a palace and prison for political prisoners. Herodias wanted John killed but Herod refused for two reasons: 1) From time to time King Herod Antipas had John brought to him. The king liked to hear John although King Herod did not understand many of John’s words. 2) King Herod Antipas feared the people would rebel against him if he killed John. Story Line: At a birthday party, King Herod Antipas had many guests. 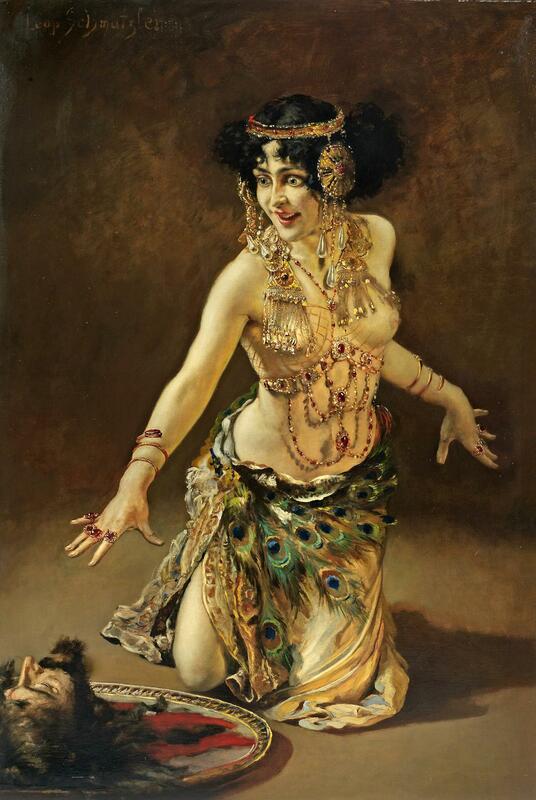 As entertainment, Salome danced for the men. King Herod was so pleased with her dancing that he promised Salome a gift — whatever she wanted up to half of his kingdom. Coached by her mother, Herodias, Salome requested the head of John the Baptist on a tray. Although reluctant to kill John,Herod had John’s head cut off and brought to Salome. Pondering Relationships: Salome was a girl, not a woman. Most likely she was less than 12 years of age. The word “girl” was also used to describe Jairus’s daughter who Jesus brought back to life. Given her young age, naturally, Salome turned to her mother (Herodias) for advice how to respond to her step-fathers offer of such a valuable gift. Salome may have been shocked by her mother’s advice. Most likely Salome asked her mother why she should give up the chance for riches by asking for a man’s head. Herodias explained that if John wasn’t killed, John would incite the populace up against King Herod Antipas and Herodias. They, along with Salome, would be ousted from their power. Salome would no long be a petted princess living in a luxurious palace. Salome’s request of her step-father was grounded in self-interest. Kind Herod Antipas could have refused his step-daughter’s outlandish request. He could have responded that he meant that he would give her riches. That he did not push back was because of the important men in the room when he made his promise. King Herod Antipas want to appear a man of his word in front of his guests. His image and regard of seemingly important men was more important than the death of a preacher, not matter how well regarded. King Herod Antipas was defeated in battle by Phasaelis’ father. Eventually, Emperor Caligula exiled Herod Antipas first to France and then to Spain. Herodias went with Herod Antipas. Tradition claims that as Salome passed over a frozen river, the ice broke and she sank in up to her neck and died. This traditional story is contradicted by Josephus’s narrative. According to Josephus, the noted first century Jewish historian, Salome was first married to her uncle Philip who was king over over areas of Asis Minor. In 34 AD, Philip died. Salome then married her cousin Aristobulus and became queen of Chalcis and Armenia Minor. Reflection: Have you ever made a promise that you wanted to get out of? What did you do? What does God say about making promises? Copyright: Carolyn A. Roth, February 28, 2019. Please visit my website (www.CarolynRothMinistry.com) for books on Bible characters. This entry was posted in Adultery and Adulterers, Fathers & Daughters, Prophets and tagged Bible characters, Bible Study, Carolyn Roth Ministry, Dancer, Herodias, John the Baptist, King Herod Antipas, Obscure Characters, Salome. Bookmark the permalink.